I think show is underrated. The opening numbers are really energetic. I think Page's solo in Stairway is beautiful and heartfelt. I agree that Achilles is nothing special, but it is decent. July 3, 1980. Mannheim. I was 14, got to the Eisstadion early in the morning with my older brother. He actually jumped fence the night before as well. We drank a number of Eichbaum Exports with some US Army boyz by the time they opened the gates. We were first in line. Couldn't help to think about The Who's Cincinnati trampling 2 years prior as I looked back & saw very much many people running strait towards me. Adrenaline flash and pow... I shot to front row center, and like a fire hose got sprayed to stage left. I quickly stuck my legs & arms into the fence until things settled down and we waited for the show to begin. And then it did. I'm almost certain it began with the drumming intro of "In The Evening" then a blast of light as the opening chords blasted off. 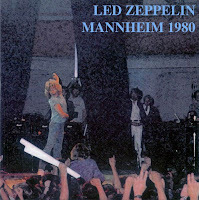 Mind you, this was 32 years ago… The crowd started squeezing again and the lady next to me turned white, fainted, then got pulled upfront by security. Robert was actually looking directly at me as he asked the crowd to "move back a touch". I think my face was turning colors as well. Why did I drink that beer?!? I think I lasted until "All Of My Love" before I finally left the front in search of relief. I wander all around bought lots of memorabilia, etc. before I slipped back up front for the last 3-4 songs. I still celebrate July 3rd to this day. I'm going to go as far as saying that this is Page's best Stairway to Heaven solo in 1980 in terms of overall musicality. The soft section in particular is outstanding. There are technically cleaner, more complex and difficult solos from 1980, but his playing is emotionally shallower than in this one. It's also very beautiful. It's one of my favorite STH solos of his whole career.